Credit: University of Illinois Laboratory for Materials in Medicine. 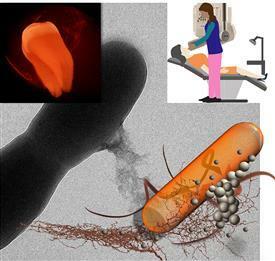 In order to accomplish this, Fatemeh Ostadhossein, a Bioengineering graduate student in Pan's group, developed a plaque detection probe that works in conjunction with common X-ray technology and which is capable of finding specific harmful bacteria known as Streptococcus mutans (S. mutans) in a complex biofilm network. Additionally, they also demonstrated that by tweaking the chemical composition of the probe, it can be used to target and destroy the S. mutans bacteria.